Now that the holidays have come and gone, the planned chaos is over. Hopefully the Christmas tree is down and people are starting to feel the groove of 2018. It’s finally the time for everyone to enjoy some relaxation! Yes, we’ve all been freezing with the winter temperatures, the snow, and ice but that doesn’t mean you should stop using your hot tub to enjoy the warmth of swirling jets. Get outside and embrace the bite of the winter weather! 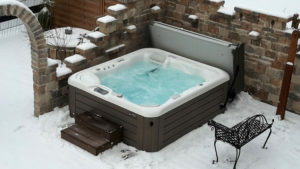 No matter how cold the temperature is outside, your hot tub is always hot and ready to enjoy! The warm water rising off the surface of the water will help to keep your face warm while the jets and bubbles will target all of the built up stress. The swirling water can be adjusted to hit all the right areas while letting the mind rest. Take the time today to visit one of our four store locations for more information. If this isn’t possible, please visit our Hot Tubs page to find your perfect hot tub!